It’s time to celebrate in this week’s issue of Doctor Who Adventures! Doctor Who is 45 years old and we’ve got 45 fantastic facts about the best television programme in the universe! We look back at the top ten Dalek moments from the history of the show. Luckily the Doctor defeated these memorable monsters every time…but sometimes only just! You’ll also get the chance to win the first four series of Doctor Who on DVD. The issue comes with a FREE Dalek mouse mat set which includes a mat, eraser and two pencils. No computer should be without one! o Exclusive posters! The First and Tenth Doctors, deadly Daleks and an amazing poster of the Tenth Doctor with his friends. o David Tennant fact file: Fascinating facts about the actor who plays Doctor number ten. o Sarah Jane interview: We speak to SJA star, Elisabeth Sladen. o Make: Create the Face of Boe with modelling clay. o Tales from the TARDIS: Trouble in Pompeii for the Doctor. o Sarah Jane Adventures: A look at the next episode, The Temptation of Sarah Jane Smith. o Puzzles and time teasers: River’s Riddles and Parallel Picture. o Comic strip: Danger for the Doctor and Donna in the second part of Time Flies. o Win: A radio-controlled Davros and fun toys up for grabs. 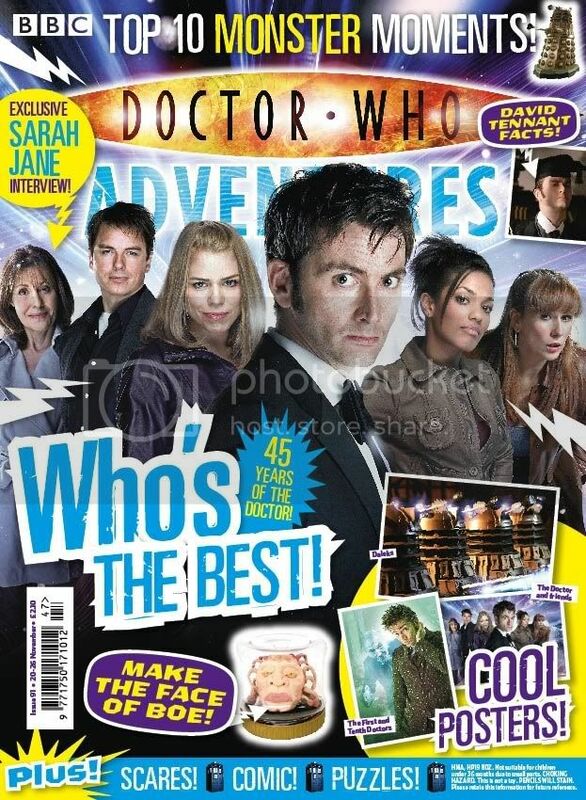 Doctor Who Adventures issue 91, priced £2.10, is out on 20 November. And many happy returns to Doctor Who! This entry was posted on November 19, 2008 at 4:14 pm and is filed under Doctor Who Adventures. You can follow any responses to this entry through the RSS 2.0 feed. You can leave a response, or trackback from your own site.